The release of a major new climate report on Black Friday is entirely consistent with the subterfuge that defines the Trump administration. The hope was that by releasing it on the busiest shopping day of the year no one would notice the economic toll foretold in the report. It is a savage irony that Trump is using the consumer spectacle of Black Friday to hide a study that predicts massive economic consequences from unchecked climate change. It should be obvious by now that Trump disavows facts that are inconvenient. He won't accept the conclusion of his own intelligence services regarding Russian interference. He equivocates on the CIA's conclusions about the murder of a journalist by Saudi Arabia. He even disputed the death toll from Hurricane Maria because it revealed how his administration's neglect killed hundreds in Puerto Rico. This is the second volume of the Fourth National Climate Assessment by the US Global Change Research Program. 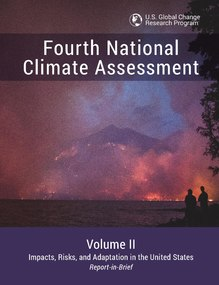 The report, which has a picture of California wildfires on its cover, is the most recent US climate report and it draws on research from 13 federal agencies and hundreds of scientists both in and outside of government. Just before Trump released the report he once again doubted the veracity of climate change. "Brutal and Extended Cold Blast could shatter ALL RECORDS – Whatever happened to Global Warming?" Trump tweeted. As everyone who understands climate change knows, a snapshot of weather does not make the case for or against climate change. Climate change is reflected in longer term analysis. We have already seen 1.8 degrees of warming in the US over the last hundred years and we will see as much as 9 degrees of warming over the next century if we fail to reduce emissions. This administration refuses to consider the economic implications of global warming. They practice a modified form of climate denial that tries to infer uncertainty about the anthropogenic origins of climate change. One thing is certain Trump's failure to act makes storms and wildfires worse. David Easterling, director of the Technical Support Unit at the NOAA National Centers for Environmental Information said this report confirms once again that humans are the primary cause of climate change. "The global average temperature is much higher and is rising more rapidly than anything modern civilization has experienced, and this warming trend can only be explained by human activities," Easterling said. As with all facts that repudiate their policy positions this administration along with their minions in the Republican party ignore research that supports the consensus view that climate change is happening and humans are the cause. This administration is at war with science and media in an effort to erode the perceived veracity of facts. They want to hijack the narrative to suit their political agenda including an insane energy agenda. While Republicans and the ruling administration have no love for natural world they claim to be preoccupied with the economy, yet they have refused to do the math and consider the costs of climate change. In addition to costs this administration refuses to pursue the opportunities associated with climate action. The new US government report is hardly the first to outline the costs of climate inaction. This report reiterates the finding of many other similar reports including the most recent IPCC report. This report warned that nations must cut their global emissions in half over the next 12 years if we are to avoid $54 trillion in damages. According to the second installment of the Fourth National Climate Assessment, the cost to the US economy alone will be hundreds of billions of dollars and it will cause the US GDP to shrink by 10 percent by 2100. However, it is important to point out that these costs are already totaling billions. In 2017 we saw a record setting $306 billion in damages associated with extreme weather events and other "natural" disasters. What makes the timing of this release far more sinister is the fact that it was released early in the hopes that it would be ignored by Americans who are enjoying their holiday weekend. The willful climate ignorance of the Trump administration and leading Republicans have prompted Jeffrey Sachs to call this "a crime against humanity". Sachs is a professor and director of the Center for Sustainable Development at Columbia University. "President Donald Trump, Florida Gov. Rick Scott, Florida Sen. Marco Rubio, and others who oppose action to address human-induced climate change should be held accountable for climate crimes against humanity. They are the authors and agents of systematic policies that deny basic human rights to their own citizens and people around the world, including the rights to life, health, and property. These politicians have blood on their hands, and the death toll continues to rise." Sachs said in a an opinion piece published by CNN. "Trump remains in willful denial of the thousands of deaths caused by his government's inept, under-funded, and under-motivated response to Hurricane Maria in Puerto Rico last year." Sachs points to the president's dismal response to hurricanes. Republicans and this administration have forged an ironclad alliance with the fossil fuel industry which is the leading cause of the climate crisis. Rather than listen to the science the Trump administration has worked to expand fossil fuel exploitation including offshore drilling in the Arctic. Failure to accept the facts means that climate adaptation investments including infrastructure are ignored. This will further exacerbate the costs of climate change. "The huge bills for Hurricanes Florence and Michael will now start rolling in: funerals, suffering, sorting through debris, and perhaps $30 billion in losses that could have been reduced dramatically through science-based planning and foresight. The American people are paying a heavy cost for the cynicism and cruelty of politicians in the pocket of the fossil-fuel industry. It is time to hold these reckless politicians to account." The flagrant hypocrisy of claiming to care about the economy while ignoring climate change will haunt Republicans. Americans of all political stripes will be forced to pay for this administration's failure to act.